Former deputy premier believes apartment-size houses can be solutions for seniors and the homeless. If you watch television programming aimed at the renovation and lifestyle crowd, you’ll find a lot of “tiny home” shows. You’ll see people showing off their micro abodes, with beds that fold out of the walls, tables that can be broken down and secret drawers anywhere you can put a secret drawer. Thomas Lukaszuk shakes his head when he’s asked about “tiny homes.” It’s a term he dislikes immensely, even though the former deputy premier has partnered with architects George Ilagan and Paul Hastings to form Urban Mews, a company that’s building garage and garden homes. Lukaszuk believes the future is in “right-size” homes, with bathrooms that offer space, bedrooms that are, well, bedrooms, and living space equivalent to an apartment. 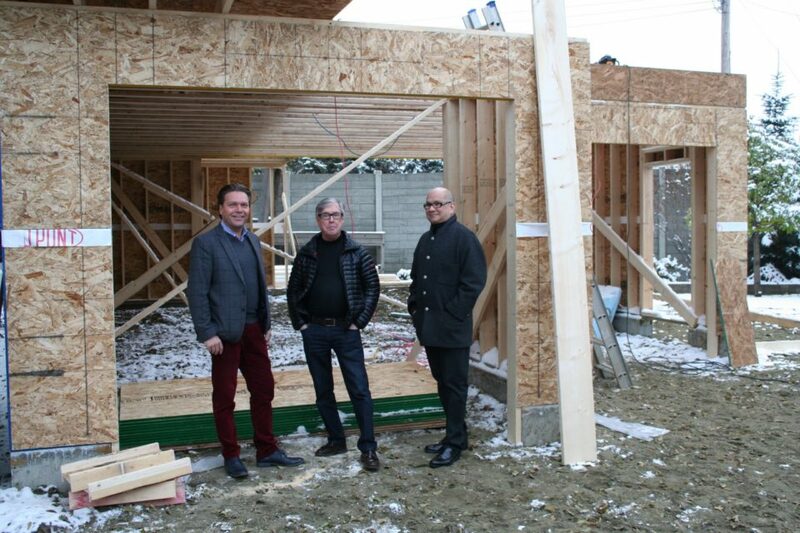 Urban Mews is building two homes in St. Albert, with orders for four more in the Edmonton area. There are plans for a seniors community in central Alberta, with residents living in tiny homes that border a central garden and park. And, then, plans are to grow the company, looking at clients ranging from people looking to rent their main home but live in the garden suite, to amicable divorcees who don’t want to split their property. Go back to 2011; Lukaszuk found out that a playground in Castle Downs was being dismantled and replaced. He asked what was going to happen to the old playground equipment, as he thought it was still in pretty good shape. “It was the old, cheap Polack in me,” he says. So, he rounded up some volunteers who saved the old equipment from the dump. They dug it out, dismantled it, and sent it to be refurbished. The volunteers flew to Manila to reassemble the playground. But Filipino customs wouldn’t clear the $600,000 worth of equipment. Lukaszuk was told by the Canadian embassy that the red tape would be hard to cut, but maybe there was a person he could contact, a Canadian working in the Philippines, who could help. The next morning, the container was released. The person in question was Ilagan, who knew the right people to call. And, Ilagan and Hastings were in the midst of building a project named “Edmonton Village,” that would take 400 people off the street and house them in a new community of small homes. “I believe that housing is the foundation of every good life,” says Ilagan, who also designs jewellery under the Baroque name, which showed at Edmonton Fashion Week in 2018. So, the playground became a centrepiece for the new Edmonton Village, and enough money was left over to help build a sewer system and running water for the residents. Years later, the group reconnected, and figured they should go into some sort of business together. At first, it was importing building materials from Europe. Then, they thought, why not use those building materials to address an underserved part of the housing market? Lukaszuk and his partners believe there could be social benefits to their work. When he was in government, Lukaszuk toured shelters that would welcome people off the street at night, then kick them out in the morning. But, when you have to job-hunt 12 hours straight, without a fixed address, how much more difficult is it to find work? And he said that, because the homeless “could only carry what was on their back,” they’d often toss the tuques and coats that they got in the winter, and had to get new ones for the next cold season. While the garden suites aren’t Urban Mews’ core business, Lukaszuk says smaller homes could work as a solution, giving people a fixed address, a place to go home to so they could fill out their applications, and store some personal belongings. “It’s a way to build homes for people who are sleeping in LRT stations when it’s -30 out,” Lukaszuk says.